Unprecedented public lamentation about the crippling fuel scarcity situation in Nigeria have dotted the Nigerian social media landscape for more than four weeks and counting. The scarcity of petroleum products returns amid a brewing fuel supply crisis over the non-payment of the subsidy claims to oil marketers. The scarcity persists despite assurances by the Nigerian National Petroleum Corporation (NNPC) that there was petrol stock of 1.4 billion litres in the country. Aligning with Petroleum Product’s Marketing Company’s claims that the excruciating fuel scarcity is artificial, the Petroleum Products Pricing Regulatory Agency (PPPRA) says hoarding and sharp practices of fuel marketers are responsible for the scarcity. Spaces for Change took its crowd-sourcing tradition a step further by using the social media to solicit for, and document individual stories describing day-to-day experiences of the fuel scarcity situation across the country. The excerpts below go beyond gathering information and digital storytelling, but also present useful information that can help policymakers understand the differentiated impacts of the fuel scarcity on men and women; highlight the gaps in the implementation of energy reform policies and in turn, better inform policy reforms, specifically subsidy reform in Nigeria. San Dee: Whether I am filling up my tank or keg, I now spend longer hours on fuel queues waiting for my turn. A bowl of tomatoes which was normally sold for #300 now goes for #400. The high food prices are just outrageous. As a woman, I am spending so much on fuel because the power supply is not helping matters. I have to buy enough fuel to power my big generator so that I could freeze my foodstuffs in the deep freezer. I also have to power the smaller generator to enable me generate electricity for general domestic use, especially for cooling the home because the weather is so hot. Kalu Aja: The fuel lines in Abuja, (North-Central, Nigeria) are epic; so is the heat. When will we finally agree we cannot sustain a subsidy on imported petrol? What is the point of “cheap” N87 petrol if it is not available?. Our refineries are still scrap and very soon, subsidy will be paid only for fuel lines to disappear for a season to return the next season. 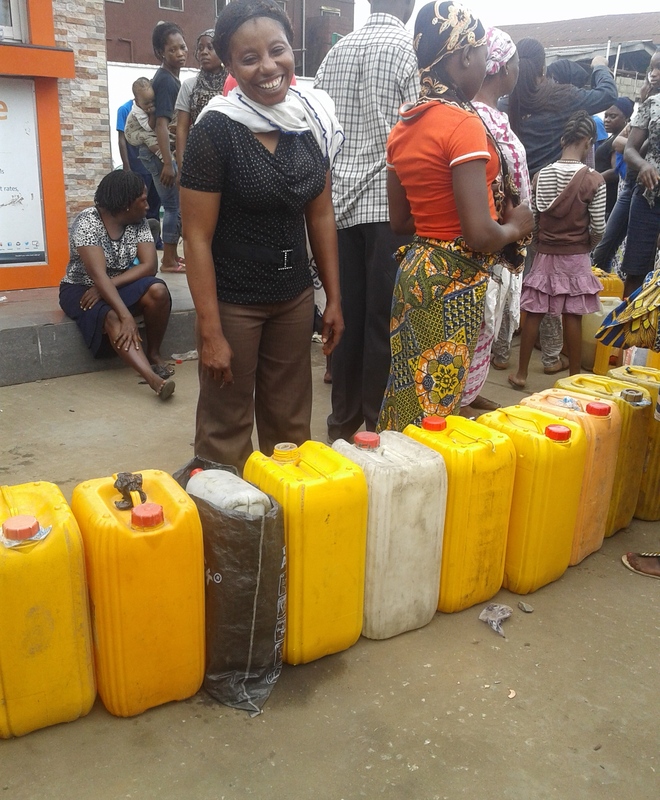 Kelechi Deca: There is no electricity, no fuel, and now, no water in Lagos State (South-West Nigeria). People are buying fuel for N150 to N200 per litre and the government still claims that there is subsidy? What then are they subsidizing when crude oil is selling at $50 per barrel and less in the international oil market? There is no way pump price will sell for above N100 if subsidy is removed. Is this government subsidizing the corruption in the oil sector, their inability to control oil marketers? Onwuasoanya Jones: I am a film maker. I have spent over N50,000 on transporting my actors and crew members to location in just two days of shooting. I have had to spend more getting every other thing necessary for this movie to be well made. Petrol is now being sold at 200 Naira and above. In the rural areas where we go to shoot, it is sometimes almost double that amount. 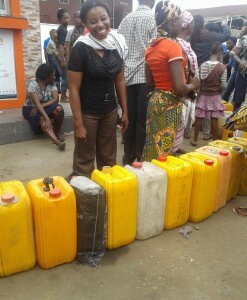 Chioma Mbakwe Ojukwu: Port Harcourt, Rivers State (South-South, Nigeria) seems to be the worst hit in this fuel crisis. At Iwofe Road Port Harcourt, tankers that want to load fuel queued on the two wings of Ada George Road coming from Eleparanwo and coming from Open Door/Chinda axis heading to Akar Base in Rumuolumini where the tank farm is situated. They have practically taken over one lane of Iwofe Road causing unprecedented traffic congestion. The queues and chaos we have in the few stations that managed to have the product and selling mostly above N150 – as opposed to the official pump price of N87 – can only be imagined. Anybody plying that route should be extra vigilant because of the hazards the trailers constitute there. San Dee: I have been sitting on my balcony for the past two hours. My generator went off on its own after burning out fuel from 7pm to 1am. The heat that immediately engulfed my body was as if I just came back from an endurance trek under the fierce sun. I have been out here and the only light here is the one coming from my phone. I am looking at buildings and different houses, but they all seem like jet-black painted mountains. No ray of light anywhere. Soon, I will be on the road off to work: no good sleep! Echi Nwogu: Yesterday, I bought N4,000 fuel from the petrol station at Egbu, Owerri, Imo State (South-East, Nigeria) at N180/litre. It just reached my tank from quarter tank to just half tank and I knew I had been milked from two ends: high product price and shortfall in fuel bought as a result of tampered fuel pump gauge. Shuaibu Mohammed: In Maiduguri, Borno State, (North-East, Nigeria), most filling stations hardly dispense fuel. But the truth filtering from various sources as witnessed by many is some of these fuel stations engage in “black market” sales in the dark of night. They sell it at above the government-approved price to the black marketers who in turn distribute to their various outlets (the small vendors with jerry cans) to dispose to the end users at far above the supposed pump price of #87 per litre. Chinedu Sandra Uchechukwumerije: On my way back from the office yesterday, I boarded a tricycle, popularly known as “keke”. The keke driver made a brief stopover at an NNPC filling station to get some gasoline. While on the queue, minutes turned into hours. So much time wasted. Bayo Adeyinka: Double Jeopardy is when you have given out your generator in response to perceived body language only for you to rush to buy another one a few weeks down the line and discover the cost has doubled due to foreign exchange differentials. Saya-Braide Ebi: Most of the people who demonstrated at Ojota, Lagos (South-West, Nigeria) against fuel subsidy removal are “repenting”. They now know better; they want subsidy removed now. Obo Effanga: By what authority did the minister of state for petroleum resources order forceful and free distribution of petrol from filling stations? And by what standards did his ministry officials go ahead to so distribute? What was the quantity distributed to each person. How transparent and equitable was the ‘sharing formula’? That was simply an unnecessarily populist, yet, unsustainable measure. Chinedu Sandra Uchechukwumerije; Passing through a petrol station, I sighted this man happily strutting out of the petrol station. You need to see the way other petrol hustlers were looking at the gallon of gasoline with this look of “I-will-kidnap-this-guy-now.” Petrol has now turned to diamonds. COMMENT: As the above narratives depict, prohibitive fuel prices, high food prices, hoarding of petroleum products, long fuel queues, increased transportation costs, loss of productive hours, traffic congestion, unlawful adjustment of fuel gauge, excessive heat and discomfort, insecurity, sleeplessness, electricity shortages, and so forth are just some of the ugly consequences resulting from the resurgence of fuel scarcity in the country. With national electricity generation capacity hovering around 4,000MW, this is evidently inadequate for the country’s 170-million population, forcing most homes and businesses to rely mainly on petrol fuel as an alternative source of energy. Fuel scarcity aggravates the burden of energy poverty, with adverse consequences in terms of health and social burdens on men and women. Nigeria has typically spent between 1 to 2.5 per cent of its GDP on fuel subsidies over the past decade. Nigeria’s subsidy bill has grown exponentially, particularly since 2011 when the government reported $14.1 billion of expenditure on fuel subsidies, equivalent to more than 3.4 per cent of GDP and 900 per cent more than initially budgeted. In November 2015, the federal government has again approved the payment of N413 billion to oil marketers to clear outstanding payments for subsidy claims. While subsidy costs continue to swell, local refineries have been shut down again due to obsolete machinery barely 4 months after the national oil company, NNPC, announced that the refineries have restarted production and were locally refining petroleum products at optimum capacity. Nigerians are yet to start seeing the impact of the reforms in the energy sector. A large percentage of the petroleum products consumed in the domestic market are imported with additional costs in shipping, storage and distribution. Retaining subsidies means that monies that could have been used to fix the refineries and improve electricity generation through aggressive development of Nigeria’s huge renewable energy potential are diverted to the pockets of a few marketers. Fuel subsidy reform is the key needed to unlock the high poverty and unemployment index that has risen from 6.4% in May 2015 to 8.2% in the second quarter of 2015. Because fuel is refined abroad, few jobs are created locally—the real production and technical expertise are located and retained abroad—and the value-added from producing refined products is lost to the domestic economy. As long as Nigeria continues to import refined fuel, no additional jobs will be created locally because the real production and technical expertise are located and retained abroad. This needs to change. The stories excerpted above, including the recent developments in the energy sector compellingly establish that the subsidy scheme in Nigeria is ineffective, unsustainable and prone to massive leakages. It is clear that the subsidy regime Nigeria has operated for many years is just not working! The subsidy system is broken, ungainly, and needs to change for the long term. As have been stated before, the time is now ripe to get rid of the subsidies to petroleum and kerosene and put them on other cleaner energy products and services that benefit women and men more, such as solar, clean cook stoves and other renewables. The current low oil price is a good opportunity for the government to plan and prepare for a switch to an automatic pricing mechanism for the long-term, and to reform energy subsidy policies, including from a gender and access perspective.